Iran’s economy chief has said that existing limitations in Iran-China economic and trade ties will be removed in the near future. Iran’s minister of economic affairs and finance says the Islamic Republic considers relations with China as strategic and plans to boost economic cooperation with Beijing. The Iranian minister noted that limitations that exist in economic and trade relations between the two countries will be removed in the near future and that the two countries will enter a new phase of economic cooperation, including with regard to bilateral investment. He added that the visit by the Chinese government’s special envoy and his accompanying delegation proved that both countries are interested in bolstering trade and economic exchanges. Tayyebnia also stated that territorial expanse, big population, existence of rich oil and gas resources, skilled and educated manpower, strategic geographical position and easy access to markets in neighboring countries, as well as security and stability in Iran have made the country a good choice for foreign investors. The Iranian minister then mentioned development of Iran’s southeastern Chabahar port and connecting the port city to Central Asia via railroad as a fertile ground for investment by the two countries. The Chinese official, for his part, noted that his visit was telltale sign that Chinese government is bent on further development of economic and trade relations with Iran. 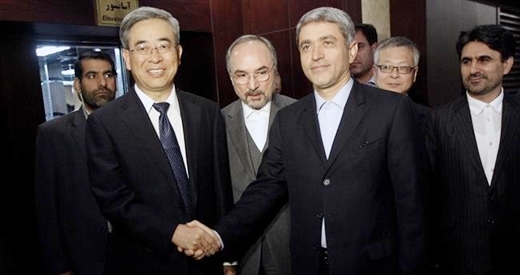 Zhang Yi, who is also Chairman of the State-Owned Assets Supervision and Administration Commission of the State Council, said development of trade ties with Iran, discussing the latest situation of bilateral cooperation, and exchange of viewpoints with Iranian officials were three objectives of his visit to the Islamic Republic. The Chinese official arrived in Tehran on September 21 for an official three day visit to Iran. He is accompanied by a delegation comprising managing directors of 18 major Chinese companies, which seek to expand interactions with their Iranian counterparts.